Before we knew it, our humble screened-porch project evolved into a sunroom that we could use year-round. And it was one of the best decisions we ever made. It can feel a little chilly out there on the coldest days of winter, though, with all those windows and electric heat, so I warm things up as much as possible. Replacing some of the yellow with red seems to help! A few thick, soft throws to wrap tootsies in do, too. And in the afternoons after the kids get home from school, mugs of hot chocolate do the trick with whipped cream and chocolate chips on top. Yum. I love listening to the Indie Holiday Station on Pandora when I’m out here (we have a Roku box hooked up to the TV so we can stream Netflix and Hulu Plus movies in the sunroom, too). 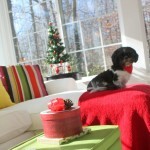 My Shih Tzu Maizie can usually be found right here on the sofa (it’s an Ektorp from IKEA). She loves to lie in the sun. She seems to think she’s a cat. She doesn’t ever really bark, just kind of makes little “purring sounds” when she wants our attention. For a long time we thought it was the result of her injuries. But then when my mom’s (adorable!) Yorkipoo pestered her a little too much one day, trying to get her to play, Maizie finally turned and yapped at her. We were stunned! It was like, wow, she can talk! 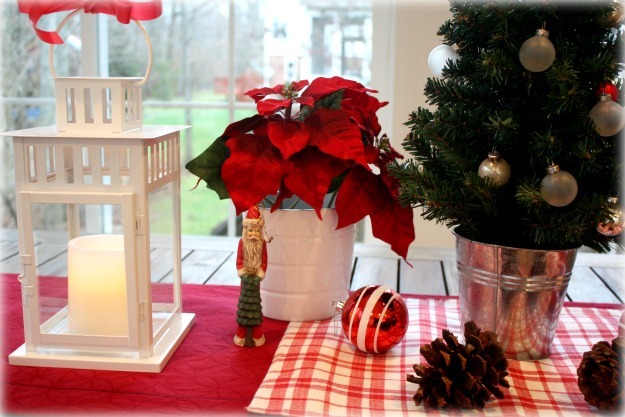 My Sunroom Is Ready for Christmas…Now All We Need Is a Little Snow! It’s Summer in My Sunroom–Come On In! O love your room. What a fabulous addition to the home. We have a screened room in Florida and I would love to make it a proper room. Did you run the AC/Heat to this room? Did you have to get a permit given it was built on an existing screened room? We just have a heat/AC unit in the wall like you’d find in a hotel room, which saved us a lot of money. We did have to get permits–including permission from our neighborhood HOA. It looks so cozy! I love the dining set, what a functional space. Thanks for sharing, Merry Christmas! I’ve been reading and re-reading and re-re-reading all your sunroom posts lately and rethought my enclosed porch concept as a result. I hadn’t realized how important it was to match the new windows to the existing windows on the house, and just looking at yours made me nix having a sunroom company build mine. Bottom line, construction starts just after the first of the year and my original builder is coming back to do the work. Thank you for the invaluable advice and all your in-progress photos! I’ll be blogging about mine start to finish. Hope it turns out half as nice as yours. I’m excited for you! Can’t wait to see how it turns out! Gosh all those windows are gorgeous! Even when the leaves are off the trees, it still brings such a woodsy feel inside. And what a great hang-out spot! What a beautiful, cozy room you’ve added, Julia! It’s beautiful and serene. So cozy! I love the view out of the windows plus the touches of red and green and a cute dog and will you make me some hot chocolate? Sorry I was rambling. Your sun room really is so cute! You should pat yourselves on the back for that decision! I can see why your family spends so much time there! It always looks completely inviting & comfy! I’ve seen all the pictures you’ve posted of your sunroom in the past, but somehow I missed the bead ceiling treatment. It looks fantastic, and is one of my favorite features in this room! Beautiful room Julia! Also, a very smart decision on your part to make it a four seasons room especially if you live in a colder weather climate. We added a screen porch on three years ago and have enjoyed it but you are limited to three seasons even in the south. I wish now we had gone ahead and made it a year round room especially this time of year. We still might do it in the near future. I love this room so much! Honestly, I could just move right in (that wouldn’t be awkward would it??). I had to laugh at your little Shih-tzu not barking much. We have a rescued one as well and he never barks but one day barked at a squirrel through the window. We were all wondering where the sound was coming from! No kidding? Maybe it’s just a Shih-Tzu thing then, huh? We can’t believe how quiet she is! Love your sun-room too Julia. We had a sun-room added onto the house too, but I failed to realize about the “windows” that they choose. Mine are not lovely like yours. We did install a Jotul in one corner that heats the room perfectly for year-round use. Well, speaking of beautiful homes…yours is just lovely Julia! 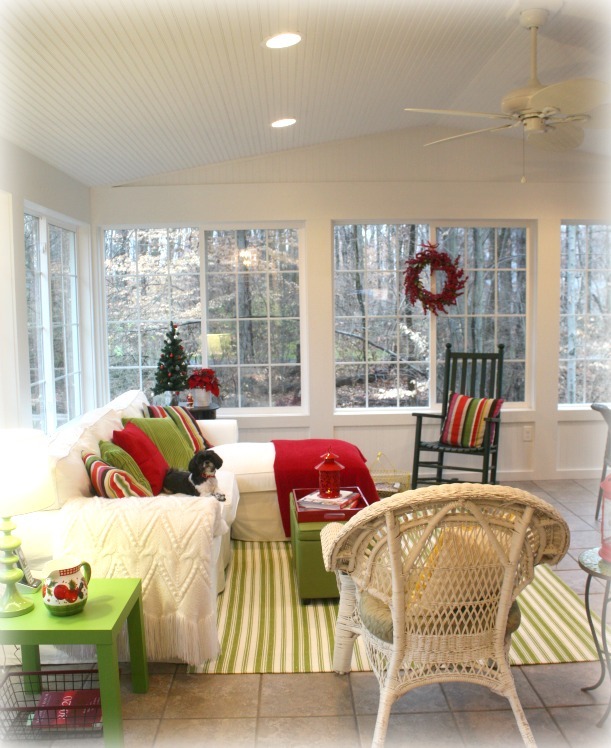 What a bright and cherry sunroom. You did well decorating it. Your blog is such a delight to visit and brings such enjoyment to all of us. Have a very Merry Christmas sweetie! Beautiful sunroom, love the colour scheme. When our border collie was a puppy he used to make noises like a cat meowing. Now he barks and loudly. Julia, Has your sunroom been in a magazine yet? If not it should be! It’s beautiful always and I love the little changes you make for each season! Love it! I love the colours you used! Very nice. 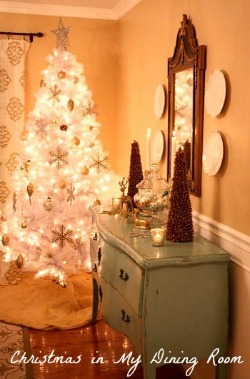 I love this room, it looks so welcoming and full of cheer. Congrats on a job well done! Did you say hot chocolate….that did it. I love the beauty of your outdoors. 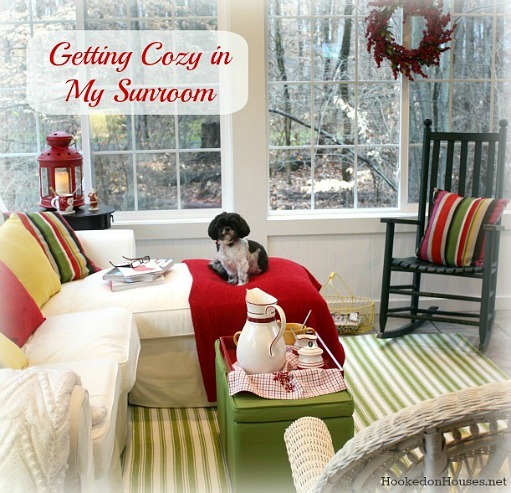 I love your sunroom very inviting and Maizie adorable. I don’t do well in the cold but I love the dream of a white Christmas. Till next time Esther from Sydney. Two of the four houses we’ve lived in as a married couple had similar sunrooms and they were my FAVORITE part of the whole house! Beautiful! What an inviting sunroom! I for sure would be spending my whole day out there. I love your warm touch with color. So cozy!!! 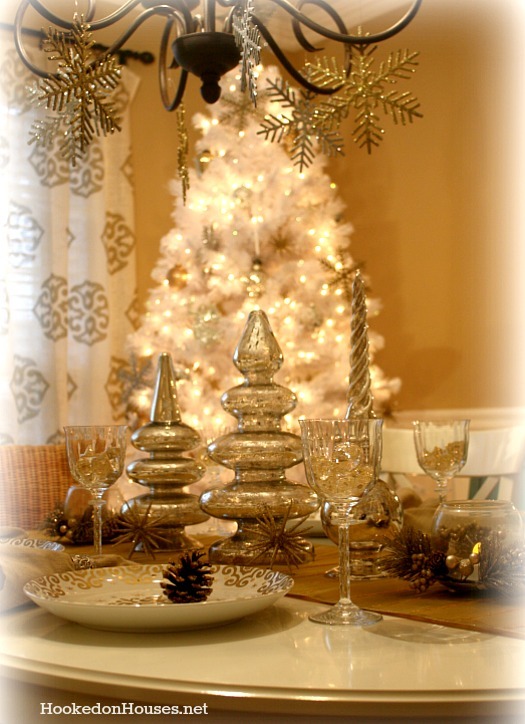 What a delicious space and it looks awesome dressed up in its holiday finery! What a cozy inviting sunroom. Your decorations are so beautiful. If I had a room like that, I would spend a lot of time out there too. it all looks so bright and happy- i love how the colors pop against the white walls! Beautiful room! Where did you purchase the rug? And is it an indoor rug or an indoor/outdoor type? Thanks, Mary! I got it from Dash & Albert: https://www.dashandalbert.com/indoor-outdoor-rugs. Like the room, like the furniture. Paint the brick white, I know you’ve pondered that. Oh, no. I actually like the brick now that the room is finished and we’ve spent time in it. I won’t be painting it! OK with me. Happy holidays, I love “Hooked on Houses”, always look to see what’s new. Everything looks so pretty! Love how you can change things up for each season! That’s what’s great with neutral slipcovered sofas. Festive, fun and what a great spot to hang out! 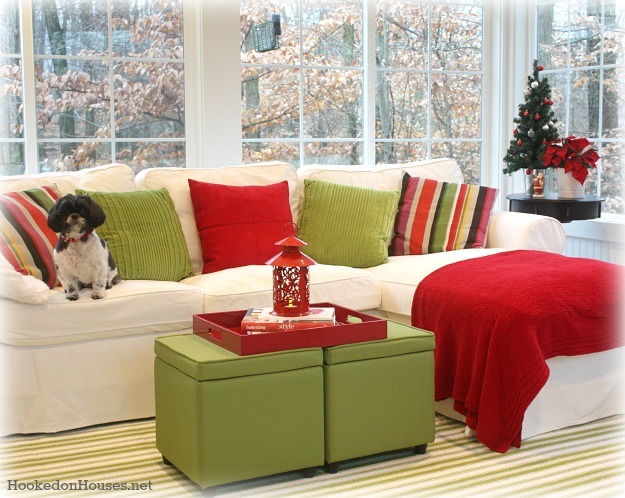 Love your lively decor and fur baby! Wow, beautiful colours. I’ve been looking for a new ideas for my lounge room for the year of 2013. I think I’ve found some cool ideas here. I have a white rocking chair just like your one. 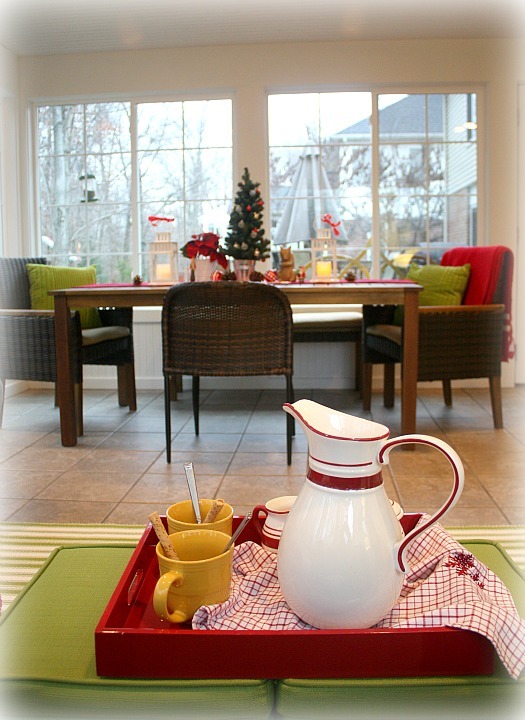 what a delightfully happy and festive place … wishing you lots of Merry in there this Christmas!